The Bulfin Heritage Cycle Rally 2019. Meandering Monks & Medieval Miles. William Bulfin was a journalist, travel writer and proud Irish Nationalist, who was born in Derrinlough, Co. Offaly in 1864. Having returned from Argentina in 1902, where he worked on the pampas amongst the native gaucho or cowboy tribe, he set off on a journey that took him through the highways and byways of Ireland, on a steel framed bicycle made by Pierce of Wexford. His book “Rambles in Eirinn” is an insightful account of his experiences along the route, with each captivating page telling a story of Ireland’s ancient past. The travelogue was first published in 1907, and proved to be a resounding success, extending to a fourth edition, published in 1915. In previous years the Bulfin Heritage Cycle Rally has followed some of the routes, as outlined in Bulfin’s remarkable book; through Offaly, Laois, Kilkenny and Tipperary. In 2018 we mapped our own route, concentrating on the history and heritage of Co. Laois, taking in such wonderful places as the Irish Fly Fishing & Game Shooting Museum, Heywood Gardens, Timahoe Round Tower & Heritage Centre, Emo Court and the magnificent Rock of Dunamase, to mention but a few! Each year we travel in vintage attire, on High Nelly bikes, and our journey is punctuated by heritage site visits, heritage talks, historical re-enactments, music and food; so ours is a gentle paced leisure cycle, despite the odd difficult hill! It’s about parking the mountain bike, the 24 gears, the carbon fibre, the racer, and mounting a bicycle from another era…something made of steel…maybe even something a little bit rusty! It’s about dressing up for Ancient Ireland, sharing our heritage in the company of the overseas guests, that regularly join us, and generally enjoying the Craic. Whether you cycle on an old time butcher’s bike, a restored High Nelly charmer, with a stylish wicker basket, a 40’s or 50’s Raleigh, or a modern replica, it doesn’t matter. What does matter, is that you get involved in a novel heritage event where cycling is only part of the fun. The theme for The Bulfin Heritage Cycle Rally 2019, is ‘Meandering Monks & Medieval Miles’ and we will forge a trail through Ireland’s rich monastic and medieval history. 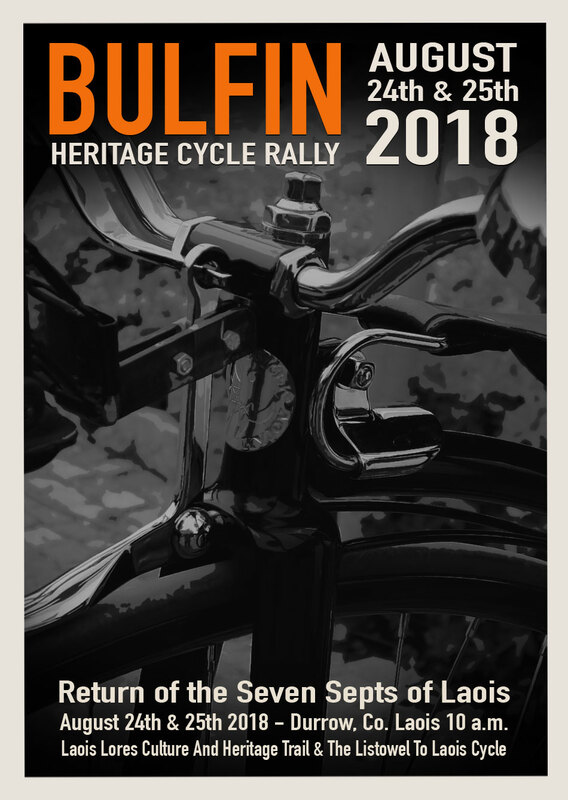 So if you are interested in cycling, history, heritage or just having a wonderful fun filled, couple of days, The Bulfin Heritage Cycle Rally, really is for you! It is a leisurely cycle, along a route that promises to be full of hidden history, and heritage, so chalk it down on the calendar – August 24th & 25th 2019! We don’t want to say too much, but we can give a few hints, such as medieval buildings, round towers, St. Fintan and St. Canice! We will update with more specific event and ticket sale details, once finalised. And remember – All You Need Is A Bike! Just follow the link above to see an overview and some photographs of Day One, from this year’s Bulfin Heritage Cycle Rally. There are lots of photographs, so it may take a minute or two to load, so please be patient.